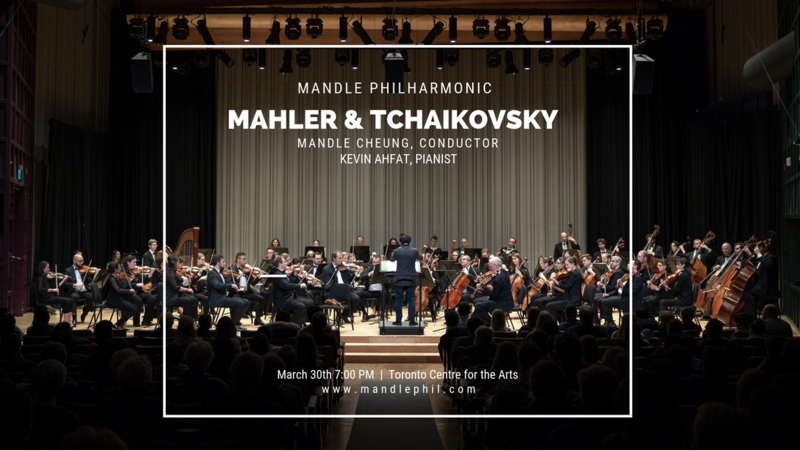 Mandle Philharmonic is Toronto's newest orchestra which exploded onto the city's music scene in the fall of 2018. It has been the initiative of Mandle Cheung, a philanthropist pursuing his conducting dream at the age of 70. His vision is to create a new space in the world of orchestral music in which he can express his lifelong enthusiasm, passion and support of music. Kevin Ahfat, the Canadian-born pianist who is “poised to become one of the young heirs of the classical piano realm” (Vanguard Seattle) makes his Toronto concerto debut with the virtuosic Piano Concerto No.1 by Tchaikovsky, and Mahler’s monumental and gloriously sonorous “Titan” Symphony tops off this grandiose evening of larger-than-life music. Mandle Phil Presents "All Awakens with Joy"
Glenn Gould Studio is easily accessible by public transit. From the TTC and GO transit stops at Union Station, you can walk west 3 blocks to the Canadian Broadcasting Centre on the north side of Front Street. Glenn Gould Studio is connected to the PATH underground walkway via St Andrew Station. All proceeds will go directly into a career development grant fund. Grants will be awarded to promising early career musicians, to aid in professional development. Taking the plunge somewhat late in life, Mandle Cheung unleashed a passion within him, a passion rare and infectious. It’s probably true to say that we might expect to look for a degree of relaxation and comfort later in life, but not Mandle. He is throwing himself with audacity into his ambitious dream of becoming an orchestral conductor. Presenting two major works, Beethoven 5: Schicksals-Sinfonie(“Symphony of Destiny”), and Mahler’s 4th Symphony - the last of the Wunderhorn (Magic Horn) Symphonies, leading into “Das himmlische Leben,” (“The Heavenly Life”), Mandle fulfils his dream, hard-won through tireless rehearsal and meticulous study, of conducting a full symphonic performance. The orchestra members, initially drawn in by curiosity (as such projects are rare anywhere in the world), have quickly grown to appreciate Mandle’s courage, and a great feeling of community and support has blossomed within the group. Directing an orchestra of nearly 70 musicians is no small feat. But as the rehearsals have progressed, he has demonstrated his deep love for the music with resolute success. It’s made a profound impact, both upon him, and the orchestra’s growth. This is an example of exceptional growth through collaboration - something which must, inevitably, be inspiring to witness: the flowering of one person’s passion and determination, to realize a dream.